If there’s one thing that’s true about Pandemonium, it’s that the aviaries are full of surprises. This was true back in August when were all thrilled to see that Olivia and Ferguson, our East African Crowned cranes, had nested directly in front of one of our webcams. This meant that there would be a live video stream around the clock as the birds watched over their eggs, allowing viewers to watch the endangered species as they cared for them, and maybe even be lucky enough to be online when the eggs hatched. As weeks went by, one of the eggs was abandoned and three rolled away from the nesting area. This left two possibilities of baby cranes, and we waited anxiously for the hatching date. When the day came, it passed without event. We waited longer, hoping that our calculations for the hatch date were a day or two off. But when Olivia and Ferguson abandoned the nest altogether, we were forced to go into the aviary and retrieve the eggs. There were no embryos. This was very disappointing, and the failure put us into position to examine the factors surrounding the birds and determine why they could not produce fertile eggs. It became clear that the aviary simply is not large or private enough. We’ve now set a goal to work towards building them a new aviary in a better setting, one where they have more space and less exposure to human traffic. This set into motion a new planning process to raise money for the cranes, and kept us occupied for several weeks. We were so engrossed in fundraising, and our care for the baby Green Nape pheasant pigeon, that it seemed as if the crane eggs were a possibility long forgotten. It was only fitting, then, that two new eggs would appear last week. Once again, our webcams show Olivia and Ferguson nesting. We were surprised and delighted at the new discovery since we’d given up hope for East African Crowned crane eggs this season. We have not forgotten the first batch that exposed the problems with Olivia and Ferguson’s aviary, and we remain determined to build them a larger one. 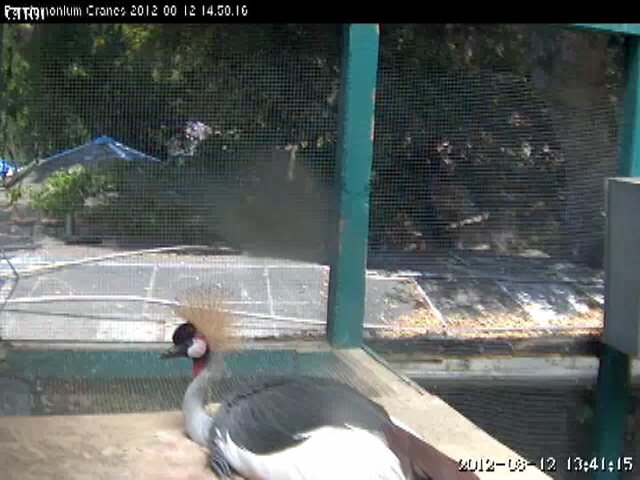 But the new eggs assure us that our cranes are ready to be parents - we need only provide them with the proper home. With these two new eggs, Olivia and Ferguson have reminded us of a very important lesson; at Pandemonium, there is always hope for the future of birds. And even if no babies come from these eggs, they have demonstrated the resilience in nature that we strive to match. We want to beat the odds, and it seems that Olivia and Ferguson do too. You can watch Olivia and Ferguson during the daytime on our webcam. Visit our Behind the Scenes Webcams page for more information and to sign up for an account.